PreCheck, a healthcare exclusive employment and background screening firm, was honored for an educational white paper. In 2015, we released our most successful white paper to date. We remain focused on producing noteworthy educational content for healthcare employers. This award is a testament to the quality of our publications. 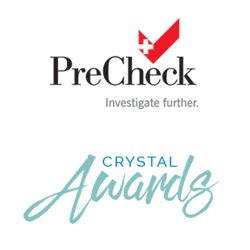 PreCheck, an employment and background screening firm specializing in the healthcare industry, took top honors in the category of Marketing Research at the 2016 Annual Crystal Awards for the white paper, “10 Ways to Optimize Healthcare Recruiting and Onboarding Processes,” on Thursday, May 12th, 2016 at the Hilton Americas-Houston. Each year, the Houston Chapter of the American Marketing Association sponsors the Crystal Awards in recognition of the most notable marketing initiatives. A select panel of national marketing professionals traveled to Houston to judge over 300 entries in the competition from companies, organizations and institutions. Unlike other awards programs, the Crystal Awards are based on results and winners are selected based on the effectiveness of their marketing campaigns. The award-winning PreCheck white paper, “10 Ways to Optimize Healthcare Recruiting and Onboarding Processes,” is available as a free download. The white paper features a panel of eight experts who share the latest best practices on how healthcare organizations can streamline and optimize their recruitment and onboarding processes to meet their hiring goals. Founded in 1983, PreCheck, Inc. has focused exclusively on serving the healthcare industry’s background screening and employment qualification needs since 1993. PreCheck serves over 3,500 hospitals, long-term care facilities, clinics, educational institutions, and other ancillary healthcare organizations, across the U.S. PreCheck has evolved over time from a background screening provider into a turnkey outsourcing solutions provider, offering a full suite of background screening, compliance, and credentialing solutions all designed to help its clients adhere to the complex laws and regulations governing the healthcare industry. Based in Houston, PreCheck has been recognized as an Inc. 5000 company from 2013-2015 and has achieved Background Screening Credentialing Council Accreditation by the National Association of Professional Background Screeners. The Houston Chapter of the American Marketing Association has been serving marketing professionals for over 50 years, organized as the Houston Business Forum in 1949 and affiliated with the AMA effective July 1, 1954. AMA Houston is the area’s premier professional marketing organization and currently is the nation’s largest chapter. AMA Houston provides marketers with the ability to remain competitive in today’s business environment through education, special interest groups and networking events.